My 2019 Live Student Course is Here! A step-by-step video course for students on putting together a stand-out college application. I'll guide you from a to z. Discover what matters to you, brainstorm essay topics, and get inspired to write. Get step-by-step guides to outlining and writing almost every required supplemental essay. Demonstrate intellectual vitality and show what gets you excited. Present a complete picture of who you are and what drives you. Manage your application and essay drafts with a whole suite of resources. This video course offers a values-based approach to producing not only a stand-out Common Application, activities list, and additional information section, but also to answering the supplemental essays that most selective schools require. Here you’ll find everything you need to tackle the application and includes Q&A sessions in which I answer the most common questions about both the college application and supplemental essay-writing process. You’ll watch a few video lessons, which you’ll have access to instantly. You’ll complete a few assignments, like writing your first draft. Then, you’ll join me live where I’ll review student essays and answer questions. You'll develop a big picture strategy, brainstorm essay ideas, analyze applications that worked, and get all the tools for creating a compelling application. Complete activities in the workbook to brainstorm topics and outline essays for the most commonly asked supplemental essay questions. Create an amazing application that you will be proud of. At the start, to be completely honest, I had no idea what I wanted to write about. My ideas were scattered and I was writing about superficial topics to dodge the fact that I had no idea what I wanted to say. Your exercises really helped me actually realize what mattered to me, which in turn helped me get started on my essays because it was much easier to write about topics I actually cared about. Ethan was the finest mentor anyone could ask for. He guided me and, more importantly, encouraged me to write the best college essays that I could possibly manage. His way of working was unique: his exercises and insights helped me perfectly incorporate my ideas in the essays. Never in any of our sessions did I feel stressed; rather he always made the path crystal clear and made me realize my most efficient plan of action. He inspired me. And as a college applicant, that’s all you really need to write great essays. Would recommend Ethan 100%! The past week, was more of a journey than a tutorial for my personal statement. Before the course, I was looking outwards for inspiration. Ethan taught me to find inspiration within myself, but best of all, he provided me the tools to put it on paper. You also had a simple way of explaining things, and had many resources in the PDF guide that I appreciated. Should I use all of the word count provided for supplemental essays? How much should I write if a supplemental doesn’t list the word count or length? What if the advice I hear from people I ask for feedback conflicts? Or I disagree with them? Will I put off my reader by including religious or political activities on my activities list? How can I tell if an activity is worth putting on an application or not? What happens if you lie in your application? If I write about community in my personal statement, but the school I’m applying to already has a community supplement, should I write an entirely new personal statement? Let's complete your application together. I distill the best and most effective resources I have ever found. I’ll personally walk you from "I feel totally lost" to "I feel like I've submitted the best application I can." Access for the entire application cycle for one price. Register for the How to Write the College Application + Supplemental Essays course and you'll be taken to the discounted offer. and it’s why so many resources on my site are free. Can’t afford the suggested price? Just click on the orange "pay-what-you-can" button above and you can request a Pay-What-You-Can spot. We have a course just for you. Want to finish your entire main personal statement, too? 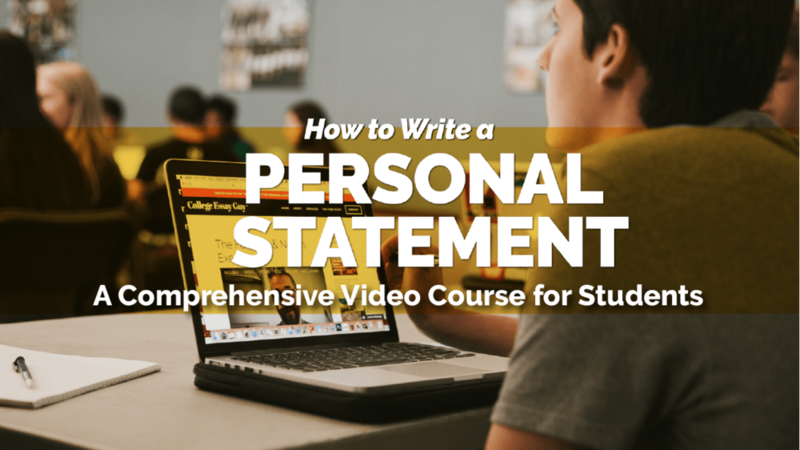 Take my most comprehensive course to writing your main personal statement. Learn how to find the right topic, get step-by-step guides to structuring your essay, and get tips on how to bring your essay to life. ARE YOU A LOW-INCOME STUDENT WITH A GOOD GPA? ARE YOU INTERESTED IN COLLEGE ESSAY & application COACHING? +HOW DO I GET 50% OFF THE Personal Statement COURSE? Register for the How to Write the College Application + Supplemental Essays course and you'll be taken to the discounted offer! Note: This discount can't be combined with other offers. As with all my courses and resources, I have some pay-what-you-can spots available for low-income students and high school counselors that work with low-income students or have little to no budget for professional development resources at their school. Just click the orange button above.